It was again, cold this morning with the mercury at 10 degrees Celsius. I decided to call it a day at the office as early as 10am as my toes were numbed from the cold. Wearing my sweat shirt, jeans, ankle socks and sneakers (forgot my vest), I thought it would be wise to head back to the hotel and work from there instead. 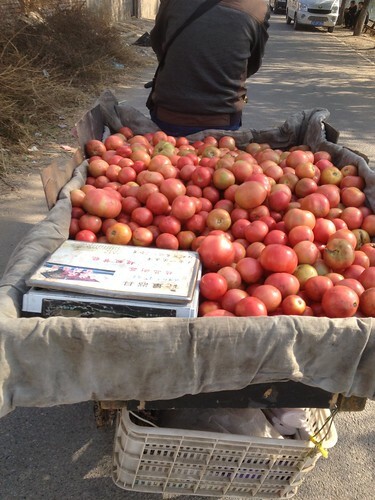 As I was walking out to the bus stop, this bicycle-cart was chugging slowly ahead of me. It was a beautiful morning with clear skies and bright sunshine so much so that I can really see where I was walking. The sun was THAT bright. I noticed the tomatoes looked rather anaemic. I think the farmer harvested the tomatoes prematurely ahead of the approaching cold front heading our way. Rumour has it that it may snow. So that puts me in an awkward situation. It is going to get cold yet I don't want to spend money on winter clothing only to wear for a day or two since I am leaving the Capital on Sunday.